John Stirling is looking forward to lots of things in 2009 - driving his car, doing his garden - and perhaps even tying his own shoelaces and doing up his own belt. Three months ago John, aged 59, from Peacehaven, East Sussex, lost his left forearm in a circular saw accident while cutting wood in his garden. 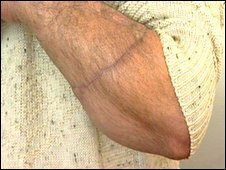 "I cut my arm off with a saw, which got caught into my jumper, and the arm came off completely in a matter of seconds," he said. "There was severe pain when it came off, but I cannot actually remember any pain for some while. When I first came out of hospital I felt most things were beyond me, now I feel nothing is beyond me. "What took over was first of all the sheer disappointment that my arm had come off and then the amazing blood loss, which became the priority. "I stemmed the blood loss by squeezing the end or the stump of my arm which was left, which I thought would give me more time to seek help." John went from house to house desperately looking for somebody to help, but nobody was around. "By the fifth my legs were trembling slightly, well more than slightly, trembling quite a lot," he said. "I had this fixation about not letting go of my stump at all, because that would give me more time, so I kicked my neighbour's door with my foot, and much to my relief, Stephen came to the door, and sprang into action." Stephen Francis dialled 999, tied a belt around the arm and kept the rest of the limb in a bag of frozen pastry. Thanks to Mr Francis's quick actions, doctors at Queen Victoria Hospital, East Grinstead were able to save the severed limb, re-attaching it during two lengthy operations. Over the next year, the BBC website will be recording John's recovery. 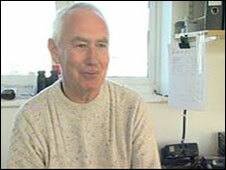 At first John had no movement in the severed limb, but now he says he is confident of making a good recovery. "It is a very gradual process," he said. "But now if there was a basket with two handles I could lift it up, and I could push a door handle down - but I can not tie a belt or shoelace." Weekly physiotherapy sessions may at first seem slow-going, but they are steadily helping John increase his range of movement. "I am just amazed when I think I can move that a little bit more," he said. "You can do all these exercises and nothing happens, then a couple of days later you think 'well that is better than it was'. "Initially I had no movement. Where it is cut off it felt like an elastic band - not part of me at all. "It just felt like a dead weight that was attached, but over the weeks - even though it is still numb - it becomes part of you." But he says things are getting better. "Movement started at the fingertips. At first it was numb, and then I got feeling and had to learn how to move. "Now I can move my wrist and I can move about an inch on my fingers. My thumb is the last digit to get any feeling and at the moment I cannot move it very much. "The hospital will know what they expect to happen as far as my recovery is concerned. I just obey and do my exercises." "When I first came out of hospital I felt most things were beyond me - now I feel nothing is beyond me. 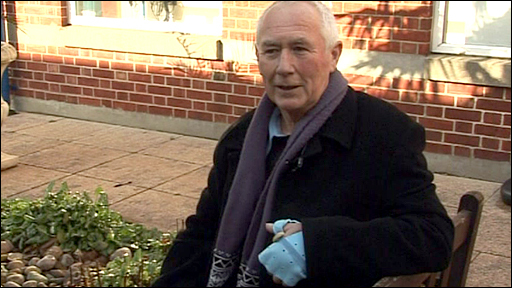 "I am hoping to do some gardening and hoping to drive again. "I am quite optimistic that I will be able to drive in another three to six months." Mr Asit Khandwala, John's plastic surgeon at Queen Victoria Hospital, said he had been a fantastic patient and that his physical and mental fitness is aiding his recovery. "He is very positive at the moment, but this experience is quite stressful." But he said that because of John's age his nerve recovery would be slightly limited compared to a very young patient. "Although he appears to be doing extremely well, he is unlikely to get the fine movement (turning small screws) that you would expect say an electrician or a motor mechanic to have," he said. "And the dexterity in some small muscles of his hand, which are furthest away from the nerve, may be poor." Mr Khandwala said they would decide whether another operation is needed in about a year's time.